In a move to give more Britons “access to attain the skills they need to create their life’s work”, community and space provider WeWork will launch its first UK-based education offering with on-campus and online coding specialist Flatiron School in London this June. The coding campus, which will be based in WeWork Finsbury Pavement, will initially provide two programming courses – a 15-week full-time software engineering course and a part-time 10-week front-end web development course – alongside an online offering. The courses, which are similar to that offered by Makers Academy, and guarantee participants a job on graduating, range in costs up to £10,000 but Flatiron has announced some financial incentives to encourage uptake. The School has pledged to give over £1m in scholarships to underrepresented groups in the UK tech community, including women and people from disadvantaged backgrounds, during its first year of operating. 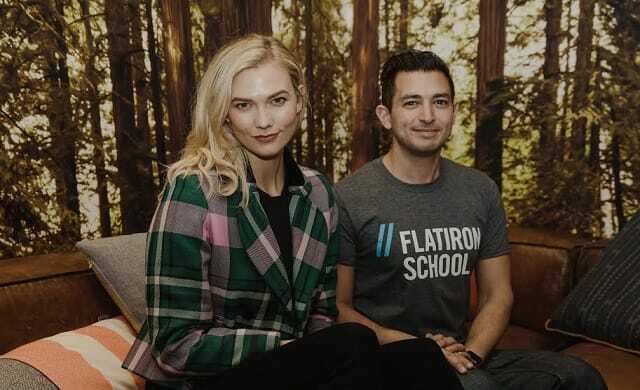 WeWork and Flatiron School are partnering with a number of female-focused organisations such as AllBright, Women Who Code and Kode with Klossy, the sponsorship programme created by model Karlie Kloss (pictured), to deliver on this. Additionally, budding entrepreneurs interested in the full-time software engineering course can take up the School’s deposit plan by paying £2,000 upfront and then paying the remaining £8,000 back as monthly instalments post-graduation when in work. The campus is the first outside of the US for Flatiron School –which was acquired by WeWork last year. The School originally started out as an accelerated programming course in New York in 2012, founded by Avi Flombaum and Adam Enbar, and later evolved into a coding bootcamp. In America, the School has helped over 2,000 students and, through job partnerships with a number of fast-growth companies including Microsoft, Etsy, Google and Apple, has enabled its students to secure careers with top firms post-graduation. “One of the first things we do when looking at a new location is to scope out employers we can work with. We were the first coding school to make job guarantees back in 2013, and that’s part of what makes us stand out. “With the acquisition of Flatiron School and the launch of our UK campus, WeWork has found a partner who shares our vision of revolutionising the way things are done – with work and with education – to help people to do what they love. To apply or learn more about WeWork and Flatiron School’s London campus offering, click here.